Latest Bluetooth version 4.1. Combine with 6G CVC Noise Reduction technology, Ensure Hi-Fi Stereo Sound quality and Strong Signal. 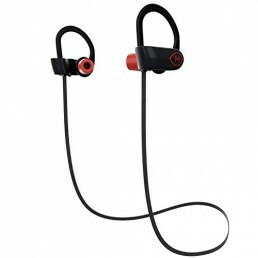 Retractable Earbuds: No need to worry the headset will be break off when you put it in your bag. Just one press to retract the earbuds. The headset cable can be adjust to the best length. This Amazing Design Provides a Simple, Unique Approach to Cord Management. Neckband Style: Wears comfortable and can decrease the burden on ears,when you do not need them and can hang the headphones like a necklace around your neck, and giving you a convenient storage way to carry. Adopt the most advanced CSR8645 chips,bluetooth signal is much more stable than any other similar market bluetoth headsets,support CVC 6.0 noise cancellation,transfer a crisp and first-class stereo Hi-Fi sound quality with bass,middle and high pitch.We believe you will thrilled if you get it!!! ①Foldable design:Super humanized foldable design makes the headset easy to storage and saving space. The earbuds retract with a push of a button, just like the cord on a vacuum cleaner. 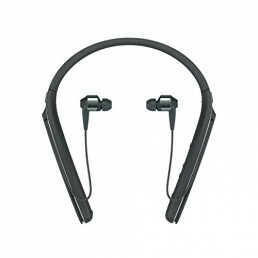 Easy to retract the earbuds.This Bluetooth headset is absolutely your best choice for daily life and holidays. ②Retractable Earbuds:Just one press to retract the earbuds.This Amazing Design Provides a Simple, unique approach to cord management,without the hassle of wires dangling around your body and do not worry about that earbuds will drop off. With the latest neckband design,can decrease the burden on ears effectively when around the neck and makes you feel very comfortable when wearing.The cord is very sturdy with technical bulletproof line. With customer previous feedback,we upgrade to the high quality battery capacity,support 18 hours talking time,16 hours music time after a 3.5 h full charge.battery level of the headset can be dispaly on iPhone cellphone. 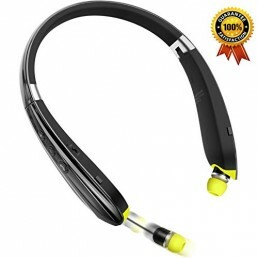 We provide you 30 days money back and 18 moth warranty about our senbowe neckband bluetooth headset. Foldable Design:The left and right neckband part can both be foldable when you do not use it,convenient to carry for daily use,provide extra flexibility, portability, and durability. Battery Life: 300h standby time,18 hours talking time and 16 hours music time after a 3.5 h full charge.Pairing Is Just Easy and Quick, Only need to pair once and easy to pair, beeps when it is running low.